A cardboard box for a home. 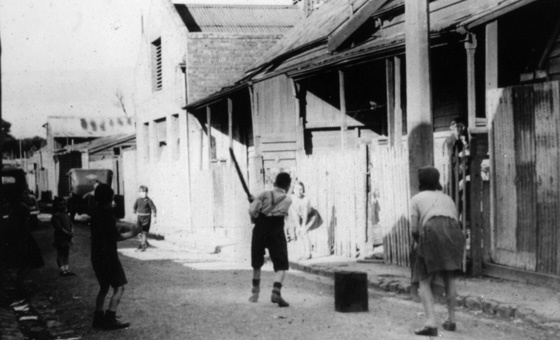 Kids playing cricket in the slums of Richmond. Dear comrades well despite getting stuck on the stairs last week, the Department of Health and Human Services responded to a letter I wrote to the Minister for Housing, the Hon Martin Foley. I did this a few weeks ago enquiring about when I or we, might be offered suitable public housing. Now that letter was written to the Minister for Housing, Disability and Ageing way back on 22 April, it is only now – Today – the minister’s office finally responded to my letter. Now just to be clear the Ministers Portfolio comes under the Department of Health and Human Services. I did ring Minster Foley’s office two weeks ago asking when I might receive a response to my enquiry. Well the greasy wheels of bureaucracy can turn slowly, and so it appears it has turned very slowly in its response to my letter. I finally received a response from the minister’s office today, and excitedly tore the letter open expecting some “good news” to my original letter, such as an offer of appropriate housing. But alias I was to be disappointed by the new Labor Minister for Housing, Mr Foley. The bureaucrat given the task of responding to my letter – or email – from April pointed out that I had been on the ‘priority’ list for early housing since February 2010. Yes, I’ll admit to that! I actually joined the general housing list in October 2009, and was moved onto the ‘priority’ list in early 2010 due to my disability and on-going health issues. So on my calculations I’ve been on the ‘priority’ list for public housing for five and a bit years, let’s say five and half years. So by October 2015, I would have been waiting six years for appropriate public housing. Now, when placed on the ‘priority’ list at the time I was told I would have to wait at the maximum two to four years for appropriate public housing. So at the moment it looks like I could be on the ‘priority’ list anywhere from six to eight years if not longer. Good thing I’m not homeless and on top of my disability and on-going health issues, God only knows what state I’d be in. The letter went on to inform me that the department was unable to estimate the waiting time for appropriate housing to become available, “due to demand for public housing, vacancy rates and the number of applications already approved for Early Housing”. The letter went on to point out that, “not all public housing is accessible for individuals with physical disabilities nor is it suitable to be modified”. Right, thanks for pointing this out. Now, it appears I don’t really have many options in regards to finally getting an appropriate public house. I could continue writing and pestering the current minister until they or he gets sick of me. The other option is taking legal action by taking the department of housing to VCAT – the Victorian Civil and Administrative Tribunal – and find out when I might be offered appropriate housing. Now, this could cause a bit of grief for the state government, but not much. So the other option I have is to take direct action against the department, such as a demonstration in the local Department of Human Services Office in Box Hill, in the way of sleeping in the offices until I’m given an appropriate response. Or I could go on a hunger strike – Bobby Sands style – either in the office or out the front of the minister’s electoral office, or in his ministerial office in the City of Melbourne. It would be difficult for me to undertake, but I’m deadly serious about getting appropriate housing. Don’t forget folks that last week I couldn’t get into the current house due to my condition and disability. I just could not lift my legs up the stairs, due to both the pain the inability of my legs or hips to move up the stairs. So I’m not going to accept the excuse from the minister’s office without a fight. Both successive Federal and State Governments have build up surpluses over the years by cutting into essential social services such as public housing. At the end of the day it is disabled, people with health issue, the poor, the elderly and the homeless who become victims of these successive surpluses. If there was an appropriate ‘safety net’ that both sides like to talk about, then myself and my family would not be in this situation; and neither would thousands of other people. On the upside the bureaucrat who wrote the response letter did acknowledge that waiting for a suitable property “is frustrating”. Now that is an under-statement. At least I’m not sleeping in a cardboard box on a very cold Melbourne winter night.